On Monday night 4th February the Norwood, Payneham and St. Peters Council voted to extend the public consultation period for the Residential Development (Zones and Policy Areas) Development Plan Amendment until 1st of March. This was in response to the large community back-lash against the lack of adequate public consultation and community concern about multi-storey flats being crammed into residential streets. The Council also resolved to write to all residents in areas affected by the rezoning changes proposed. Three public briefing sessions will also be held, one in the Payneham Library complex and two in the St. Peters Town Hall Banquet room during February. At present the dates for these briefings have not been set. Residents are urged to come to the briefings to ask questions of Council's planning staff and to present their concerns. The public hearing for residents' submissions will still be held on 5th of March in the Mayor's Parlour in the Norwood Town Hall complex. A large turn-out of the public is needed at this hearing to persuade councillors to listen to their constituents' concerns. The proposal is available for viewing at the Draft Residential Development (Zones and Policy Areas) DPA - Public Consultation page of the Council website. Page 72 of the Residential Development (Zones and Policy Areas) DPA (13050 kb) has a map showing proposed policy areas. 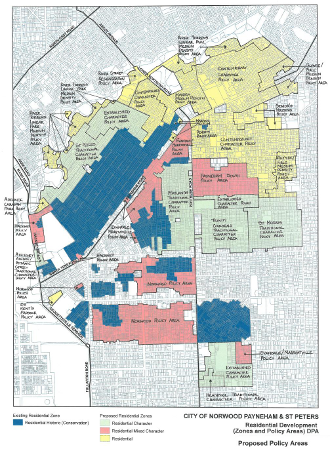 Section 3.2.4.3 Residential Zone on pages 69-77 describes the proposed policies, including which areas are earmarked for 4 and 6 storey developments in medium density areas highlighted yellow on the map. We have updated the Respond to Development Plan with information on how to make your submission.